‘It is just as if a man, traveling along a wilderness track, were to see an ancient path, an ancient road traveled by people of former times. This man would follow it and following it, he would see an ancient city, an ancient capital inhabited by people of former times, complete with parks, groves, and ponds, walled, delightful. This sutra divides neatly into two sections. Consider which core teachings are discussed in each section and how they relate to each other and become elements of the parable of the ancient city which is presented in the second section. The term middle path, in popular usage, is thought of a halfway between two extremes or a midpoint compromise, but that isn’t what was meant by “middle path” in the ancient scriptures. Consider how this sutra presents and defines the middle path. While dependent origination is most commonly depicted as a chain with twelve links, here we find a variation with only ten links, ignorance and volitional formations being left out. 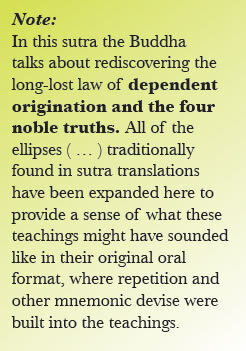 Also, in this sutra, name-and-form and consciousness are tied into a tight loop, flopping back and forth on each other. Consider what can be understood by viewing consciousness in this special light, particularly in relation to the ending our clinging, to dukkha and to awakening. In this sutra it is said that “from the cessation of name-and-form comes the cessation of consciousness.” Following that, there is a domino effect which ends with “the cessation of the whole mass of suffering.” Consider how you might practice with this understanding during a personal crisis to lessen the stress and suffering. What aspects of this particular presentation of dependent origination could you use to stop a headache?